Once more the team from Wings and Wheels publications have surprised the helicopter researchers with the new Title in the Blue Line Present Aircraft Series No 11, ISBN no 80-86416-38-0. 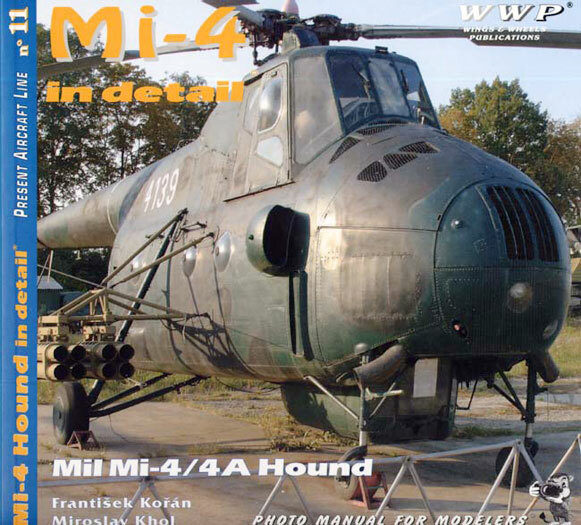 This edition is all about the Mil Mi-4 /4A Hound in Detail. The authors are Frantisek Koran and Miroslav Khol. Published in the now familiar format and it has 72 pages crammed full with 278 photographs, 10 side profile drawings and 12 technical drawings all of superb quality and most importantly clarity. The text is brief and to the point and is in English. The book gives the history of the helicopter and plots the development from mark to mark. Split into the usual chapters it takes you on a magical walk around, up and over and through the helicopter. No detail however small is omitted and some of the line drawings help to point out parts that you would normally skip by or not even see. As each page is turned you marvel at the colours and sharpness of detail, it is truly a model maker’s dream, for those who think that Military helicopters are dull drab machines, think again. Since the majority of the photographs are taken outdoors at various Military Museums, this does reflect in the extreme weathering that can be seen. You have to look past this; after all this not how they look in Military service. Like all books in this series it is the depth and wealth of detail that they contain not only for the military researcher and model makers but also museums and those lucky individuals who can afford to own one. The quality of the photographs shows the insight that the authors have not only in the selection but the detail that modeller’s have come to expect from this very prolific publisher. On a personal note having fastened many a wire locking seal to jet engines and when you can count the number of turns used by the fitter; you can be certain the finest detail has not been overlooked. It certainly took me back into my days and long hours working in cramped conditions on jet engines. I have to admit that I did not know if any kits of this helicopter are made but thanks to a few postings on aircraft forums I was given the full details of a site Heli-kit-News and they provided me with enough to say that you can build it from 1/144 to 1/35 scale so all tastes and scales are covered. Under the fair review part of the copyright law I have selected one photo to illustrate the level of detail contained in the book. It was not an easy task and in the end I hope you will agree with me that this speak volumes. 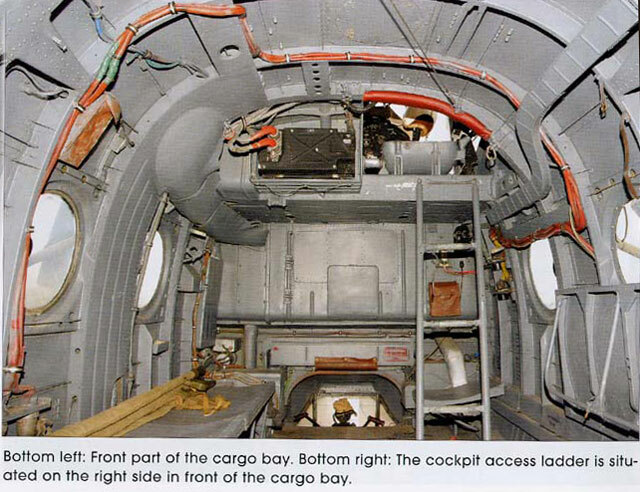 It is the left hand section of the cargo bay. Since this a review copy it is best to check with local book dealers for price and availability they do vary country to country. For our American readers who like a score out of ten, I give it ten all round for originality, content and photographic quality. Go out and buy your copy now, you will not be disappointed. Highly recommended for those who are interested in Soviet Helicopters.